This 2-day tour allows you not only to experience the wonder of the falls but also to see some great scenery on the way! Leave New York and head north past the beautiful Delaware Gap to Watkins Glen State Park in the heart of the Finger Lakes region. Enjoy a walk through Watkins Glen Canyon to visit the beautiful waterfalls and then continue to the Niagara Falls, passing by Seneca Lake, arriving late afternoon. You will start by touring the American side of the falls including Goat Island and Sister Island, then at night tour the Canadian side. Accommodation is provided on the Canadian side of the falls at Executive Inn Super 8. After some well earned rest, the next day begins with the Maid of the Mist boat tour (May-Oct) or the Scenic Tunnels during the winter months. At noon you will depart south to New York State. En route enjoy a shopping experience like no other at one of the largest malls in the State - bargains guaranteed! NEW-YORK – FINGER LAKES – NIAGARA-FALLS - This morning we depart from the Big Apple heading north where we will pass the beautiful Delaware Gap to Watkins Glen State Park in the heart of the Finger Lakes region. Walk through Watkins Glen Canyon to visit the beautiful waterfalls and then continue to Niagara Falls passing Seneca Lake, arriving in the late afternoon. Tour the American Side of the Falls including the American Falls, Goat Island and sister Island. At night tour Niagara Falls where we can appreciate the colorful lighting of the waters. Overnight: Niagara Falls – Executive Inn Super 8. 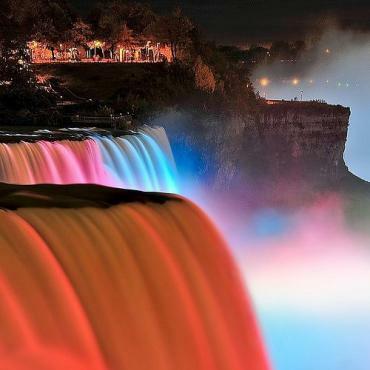 NIAGARA-FALLS – OUTLET SHOPPING - NEW YORK - Leaving the hotel, hear the thundering water of Niagara-falls. See the falls up close from the Horse shoe falls and, experience the power aboard the Maid of the Mist (May-October). In April tour the Scenic Tunnels. At Noon we depart south to New-York Sate. On the way to New York, enjoy a shopping excursion at one of the large outlet malls along the way, find your own bargain with brand name stores for less. Evening return to New York. Please note tour departs Mondays and Thursdays only and prices are based on twin/double room occupancy. Single rooms are available at a supplement - on request. Arrive back in NYC around 8pm on Tuesday. TOUR INCLUDES: 1 night hotel including tax, Air conditioned Van or Bus & Professional Tour Guide, Sightseeing in Niagara Falls, Admission to the Maid of the Mist (Summer) or Scenic Tunnels (Winter).